Ga xao xa ot (spicy lemongrass chicken) combines what a friend calls the holy trinity of Asian spices…lemongrass, chiles, and garlic. Marry these ingredients together and your kitchen will be infused with such an enticing aroma, your passer by neighbors might invite themselves over for dinner. Chicken is the perfect vehicle for these fragrant spices and makes this common dish a staple on the Vietnamese table. But make sure you use dark meat for this dish. Breast meat has a tendency to dry out–so be extra careful with your cooking time. 3/4 cup low sodium chicken stock or coconut juice (not milk)–use a cup if you want more sauce. 2 tbs of fish sauce. Mix the ingredients for the marinade and marinade the chicken for about 2 hours or overnight covered in the fridge. In a large wok or frying pan on medium high heat, add about 1-2 tbs of cooking oil and fry garlic and lemongrass until they are fragrant but not yet browned. Turn on high heat and add the chicken and sear until outside is browned, and stir occasionally. Add dried whole red peppers and stock/coconut juice, cover and cook until juice is reduced by about half. Make final seasoning adjustments and add the green onions just before turning off heat. Serve with jasmine rice or use in banh mi even. 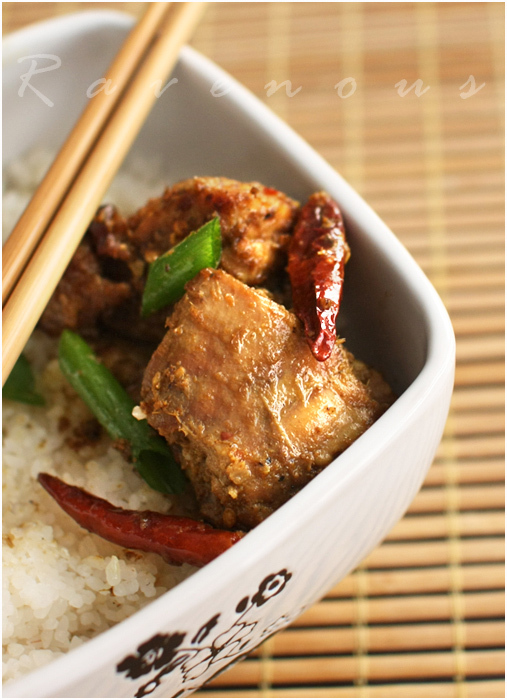 Ga xao xa ot is really an easy and flavorful dish that can be a staple not only on the Vietnamese table, but yours as well. Wow, this looks delicious. And intriguing flavor combination with addition of turmeric and sesame oil. I wonder if I could use kaffir instead of lemongrass (since this is what I have in the freezer and don't want to go to the market…)? julia: we're not sure that kaffir lime leaves would a good substitute..we always keep a container of preminced lemongrass in the freezer just in case we don't have any fresh ones..most asian markets will carry that. Wow…looks very delicious. I can tell by the colour. I will be very happy just to have this with rice and some slices of cucumber. hahaha holy trinity of asian spices lemongrass, chilies and garlc! Hi Hong & Kim To answer Julia, yes, kaffir lime leaves can be used, but make sure the leaves are torn up for stronger flavour. I always use lemongrass and kaffir lime leaves interchangeably, and they are both very similar in the taste/aroma they impart. This dish is hawt! You don't need to convince anyone it's full of flavour. 😉 Great shots! I love this combination of spices for the chicken. Isn't it amazing how the same ingredients might be used differently in various parts of the world? I actually have a lemongrass plant in a pot it grows in abundance here yet it is not a popular seasoning ingredient. Mary: something cool and refreshing as cucumbers or pickled veggies would be perfect with ga xao xa ot! Ju: Thank you so much for helping us out and imparting your knowledge! Kaffir lime leaves aren't that common in Vietnamese cuisine, so thanks for letting us know! Wizzythestick: you're absolutely right–definitely try lemongrass, you'll love it! Definitely full of flavor, and spicy! Would be great served at room temperature too, as an appetizer for a party menu. 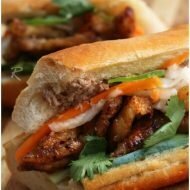 debi: we think it's versatile too–add the lemongrasss chicken to banh mi and you have a great sandwich! I like the versatility of this dish, and that much of it process can be made ahead of time. Funny enough I have both lemongrass and kaffir lime leaves, so I may use both when I try this recipe. This dish looks delicious!!! Ooh, you posted the one I'd hoped you would! Looks so very easy, and I'm thinking there'll be some pretty happy people here if I make this! That marinade ingredient list looks just delicious…. I love this! So much so that I might actually try to make it! Mouth is watering. I think a bit of drool is on my keyboard right now. christine: ooh, now that's be adventuresome, kaffir and lemongrass! tammy, misty: let us know if you ever make this! kathy: we're glad to induce drool..
bao: let us know if you ever make ga xao xa ot. 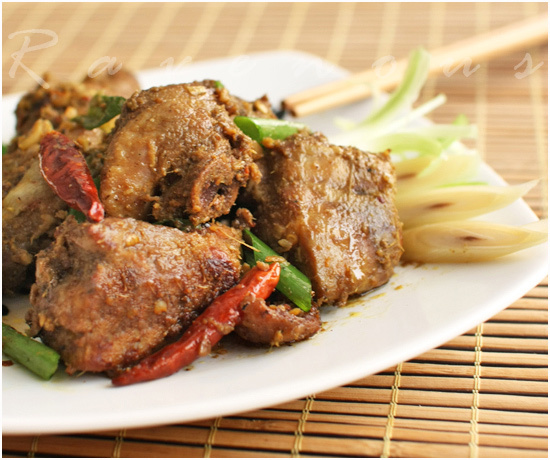 I just love lemongrass and spicy + lemongrass = chicken just sounds like such a winner – thanks for sharing! That turned out wonderful! I decided to pad out the sauce with some pearl onions. I think I may have a bit heavy on the tumeric, judging by my radically yellow color but the primary flavor was still the blend of lemongrass and heat. Andrew: Great idea to add pearl onions and thanks for photo! Just tried this in banh mi last week, and it was absolutely delicious! I'm so thrilled. I will definitely be trying more:) Love Vietnamese cuisine. Thanks! Hi guys, I have preminced frozen lemongrass…how much should I use in place of the 2 stalks? I was thinking about 1 tablespoon per stalk, does that sound right? This is one of my favorite dishes at local restaurants! Thanks for the recipe. just thought i’d say i tried this recipe last night (with a couple of veg additions) and it was spot on. thanks very much. I just wanted to say thank you for all your recipes. I have tried 5 including this one and they were always delicious! Now I am no longer the girl that can’t cook. Thank you so much! Wow, you guys make this dish exactly the way that I ‘ve been making them. I also prefer to leave the bone and skin on. Gives me an excuse to pull out the cleaver. Love your site. Wow I just made this and it was so tasty! I substituted the red peppers for red chilli paste and added green chilli at the end when adding the chicken stock. Loved all the flavors and the spices really kicked in! Thanks for posting! Next time I’ll try this with banh mi! I want to try this receipe soon but I’m not sure about “dried red peppers” How do I prepare the peppers so that they are dried? thank u so much for this recipe ! made this dish for dinner tonight and my beau loves it ! he says it’s the best ga xao xa ot ever ! btw , love love love ur website . kudos to u both ! 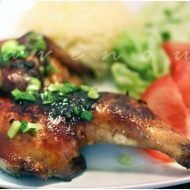 Hello, can you clarify that if the marinade is discarded or added to the pan with the chicken during cooking? Thanks! 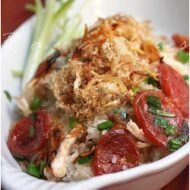 I just wanted to say THANK YOU so much for sharing all of your wonderful Vietnamese recipes. My mother was a wonderful cook and was always in the kitchen. I have very fond memories of my mother and her love for food. She passed away 5 years ago and I regret not learning to cook from her. I have tried at least 10 of your recipes to date and love them all. They remind me of my mothers cooking. Thank you for sharing with the rest of us! I’m in the midst of making this recipe & notice there’s no salt in the ingredient list or directions. Is this an error? I’ll make it without for now to follow the instructions but suspect I’ll have to add it after the dish is cooked. I’m using an Instant Pot to sear & cook this recipe. Its way too hot to use the stove in Texas right now.